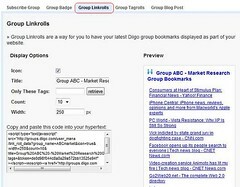 Group Bookmarks Auto-Posting is now available! Diigo groups are widely embraced by many work groups, interest groups and school classes for collaborative research. 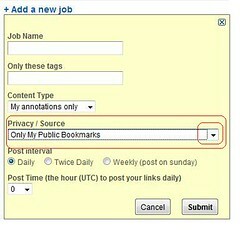 From listening to our users’ feedback, we have now made it possible to automatically post group bookmarks to your blogs! 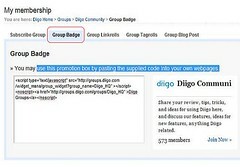 This “Group Auto Blog Post” feature will enable group member to automatically post your group bookmarks to your blog(s) daily or weekly – a super easy way to share your group’s findings with your blog readers! Fill in the form. Select your group from the “Privacy / Source” pull down menu, and Submit. That’s it! All of these are great ways to help you publicize your group and share your group’s resources! Give them a try and let us know what you think. This is great! I’ve found the blog post service to be really useful although i’ve had more than a few problems with posting format and length. My blog posts are routinely cut off. Is there a discussion somewhere where i can learn how to fine tune the settings? I also need a better understanding of how comments, highlights and sticky notes are posted to the blog site. This is a great idea, and almost immediately i became very dependent on the service. Possible improvements would be greater control over HTML-CSS settings. Also, i can see where a twitter cross posting of the diigo subject line would be helpful. Many group members are also following each other on twitter. It would save some time if my diigo group post could simultaneously be posted to twitter AND my Google Calendar. A twitter calendar posting would help me keep track of my time/ Very useful to productivity i think.